I’m very much swinging in the branches. Goodness 3 days with out a blog post. We had a very busy weekend… and by the end of each day I was just too tired to write. Thanks to those of you who were worried I'd dropped off the tree. I'm very much swinging in the branches. 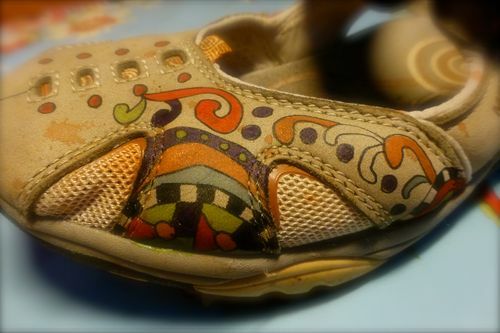 The photo below is of my favorite sandals, I wore them once when I was dyeing and I got ink all over them, so I'm covering up the spots with illustration on my shoes. I don't know if I'll cover them with drawing… It might be a bit much but its fun doing it. Today I had to catch up with Teacher projects, patterns and kits and it took almost all day. Goodness, I reference and cross reference and sometimes I still make mistakes. You know, actually, I did write a blog. It was prompted by the fact that our Daughter Callie wanted to do something special for our friends who supported us through our adoption process. I've saved it, maybe I will post it someday. We had our annual luncheon. The temperature rose to 100 degrees but we have a shaded area at the back of the house and with the aid of a few fans, it was quite pleasant. Callie and Husband Benny had been preparing for days. We don't have air-con in the kitchen upstairs and I felt really bad they had to cook in that heat but they did it admirably and everyone loved the food. Keith and I were able to spend time with our friends.. we just had the clean up to do. Keith did most of the dishes bless him. The menu was amazing, we really couldn't eat it all. We have another resident chef at home and so he cooked up the left over scallops, squid and prawns for dinner. So My Gal Cal, thank you. Pam, I wish I could read of your and Keith’s journey through your lives of parenthood. If you’ve written of it already, please send a link. Your family and friends sound extraordinary. Good on Callie for creating such a meal of dishes that sound so exotic to us. Eileen, its all written down, the book will tell all.